Having taken some time off to recover after the A100, Ultra Runner, Chris, sets about training for his next gruelling challenge. A temporary change in job location during November meant that most of Chris’s training plans went out of the window. Still, he battled through, taking mileage where he could, some of it good some of it bad, but most of it in the dark and wet (his Exposure Verso was a saviour!). At the start of this year, Chris knew he was going to require some additional focus on one of his premier Single Day Ultra Races “The Country to Capital.” As the event was less than 3 weeks away, Chris planned a 30-mile day out on the course – which turned out to be cold, hard going and an absolute bogfest. 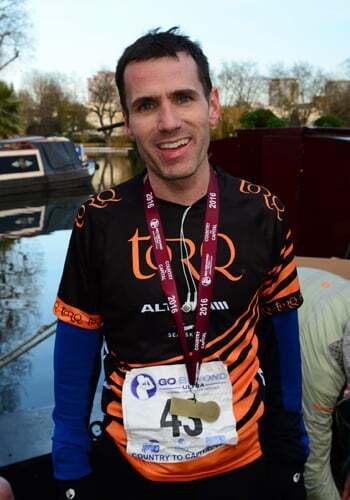 On the actual race day, Chris finished the tough “Country to Capital” 45 mile run (from The Shoulder of Mutton pub, Wendover, to Little Venice, London), in a highly respectable 5th place, with a time of 5:24. Over the last 18 months Chris’s progress has been good and, despite the broken ribs, has included a couple of wins and podium performances. This year, Chris plans to focus his training on increasing his mileage and speed. Chris in now including some back to basics strength and conditioning work, ahead his next big event in March, “The Transgrancanaria” – which he’s really looking forward to. This race includes an incredible distance of 125km and has 8,000 metres of climbing (in the warm!) After this epic event (where the Elite competitors have up to 30 hours to complete the race), Chris will compete in the Manchester Marathon in April.